This “Getting Started With MYOB” tutorial is provided by MYOB Training Adelaide. For one-on-one training, or boardroom presentations on MYOB’s more advanced features, contact us on 0435 990 480. Let’s start with the sample company. The first thing you need to do once you’ve opened MYOB, is to click on the “Explore the Sample Company” link, to open it. This will open the MYOB main window. 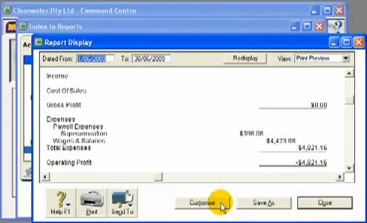 Here, we can see the menu bar with MYOB’s main menu items and one of the main parts of MYOB that you will use – the “Command Centre” window. In the full version of MYOB, there are 8 command centres, that can be accessed by clicking the appropriate Command Centre icon. Let’s click on the Sales Command Centre. As we do, notice that the icon changes to indicate that this Command Centre is currently open. You’ll also now see a flow chart containing the tasks that can be performed within this Command Centre. Below the Command Centre, are four options which allow you quick access to a range of tasks in MYOB. For example, the “Find Transactions” window is useful is you need to search for a particular transaction, while the “Reporting” option allows quick access to a range of reports available in MYOB. 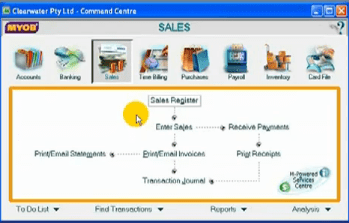 However, most of the information entered into MYOB is done through the flow chart section of the Command Centre. Clicking on one of those tasks, such as “Enter Sales” opens a new MYOB window where the information related to that task is entered. So now that we’ve explored MYOB a little, we can move onto the next step in “Getting Started With MYOB” – Creating a new company file. 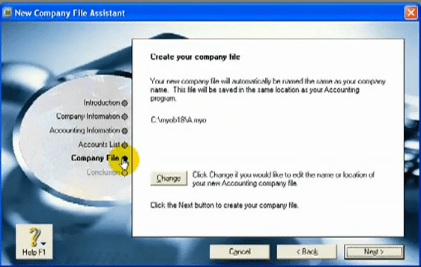 From the “File” menu at top left of screen, select “New” to open the new company file assistant, where you will simply answer the questions it asks, to create your new company. At this point we should mention, that you don’t have to be legally structured as a “Company” to use this. It’s just MYOB’s terminology for a new business entity. You can navigate through this MYOB assistant either by clicking the “Next” button, or by clicking the options to the left of the window. Now that you’ve learned how to create your new company data file, to finish this “Getting Started With MYOB” tutorial, let’s just spend a little time learning how to run reports in MYOB. 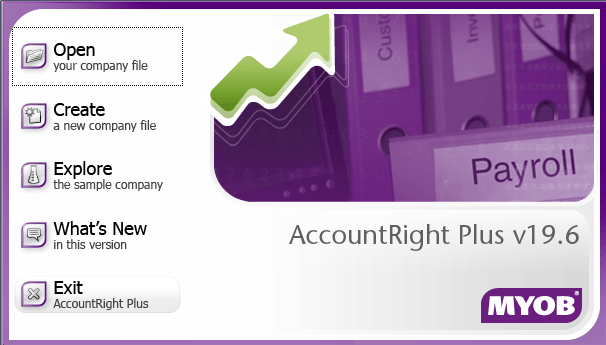 If you’re getting started with MYOB, you’ll be glad to know that this program has many pre-programmed reports that users can run at the click of a button or two. To access these, click the “Reports” button at the bottom of the Command Centre. This opens the “Index to Reports” window where you can search through the list of reports available. 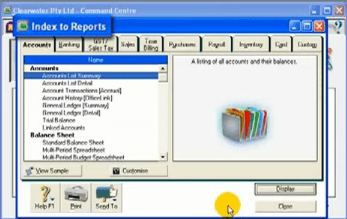 These reports are organized under different tabs that generally correspond to the Command Centres in MYOB. When you open the “Index to Reports” window, MYOB opens the tab corresponding to the Command Centre that you’re currently in. Simply click on the relevant tab if you wish to view a different set of reports. You should take some time looking through all of the reporting options to familiarize yourself with the location of various types of reports that MYOB offers. To display a report, find it in the list and highlight it by clicking on it in the name column. Then click the “Display” button and the report will open up in a new window. You can customise the options in the report by clicking the “Customise” button, as shown above. Depending on the report, you can customise options such as the date range and the “report level” in the “advanced filters” tab. In the “Finishing” tab, you can select whether to include zero balances or account numbers in your report. Once you are satisfied with your selections, click “Display” and you will now see the report with these changes. Remember that there are often several ways to complete the same task in MYOB. So that’s a quick overview of getting started with MYOB. We have explored the sample company, created a new company file and learned how to run reports. Now it’s up to you. If you would like further one-on-one training in some of the more advanced features of MYOB, please contact us on 0435 990 480 and we’ll arrange to visit you, or you can come to our office at South Plympton.